Secalia, Mo. (April 24, 2017) - The State of Missouri has just unveiled the Leroy Van Dyke Highway sign this past weekend. The momentous occasion took place in Sedalia, Missouri, at an event held at the Liberty Center. Missouri’s most elite dignitaries were on-hand for the event, including Missouri State Rep. Steve Cookson, Rep. Nathan Beard, Rep. Dean Dohrman, Lt. Gov. Mike Parson and Mayor Steve Galliher. 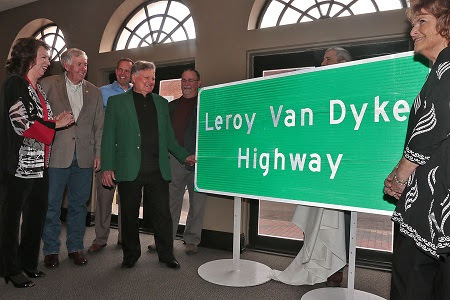 The highway pays tribute to country legend Leroy Van Dyke, who is a Missouri native, currently residing in Pettis County. The named highway is a portion of 50 Highway, west of the intersection of Highways 50 and 65 in Sedalia. Known for his unique, unmistakable music that captivated audiences upon entering the music scene in the mid-1950s, Van Dyke has recorded some of the biggest songs of all-time. After launching his debut single “The Auctioneer,” the chart-topper quickly became a staple in the country music genre. This year also marks the 55th Anniversary of the worldwide smash, “Walk on By,” which has withstood the test of time, recently being named Billboard’s No. 2 Greatest All-Time Country Songs, based on sales, number of plays and number of weeks in the charts. The hit maker has no plans for slowing down any time soon, with more upcoming appearances of The Leroy Van Dyke Country Gold Tour. Bringing traditional country music to fans all over the world, the one-of-a-kind show, by definition is a classic country music show, featuring artists who have had million sellers, or many top ten recordings, or massive television exposure. Leroy opens the show, then emcees the event as his seven-piece band backs the rest of the presentation. Upcoming shows later this year will include country legends like Van Dyke, in addition Jimmy Fortune, Rex Allen Jr., T.G. Sheppard, Steve & Rudy Gatlin, Bobby Bare, T. Graham Brown, Barbara Fairchild, David Frizzell, Moe Bandy, and more (lineup changes venue to venue).